World number four Roger Federer won the Paris Masters for the first time in his career with a 6-1 7-6 (7-3) victory over Frenchman Jo-Wilfried Tsonga. The 30-year-old, who had never reached a final here, survived two break points in the opening game before racing to the first set in just half an hour. Third seed Federer took a 4-0 lead in the second set tie-break and wrapped up the match in an hour an 25 minutes. 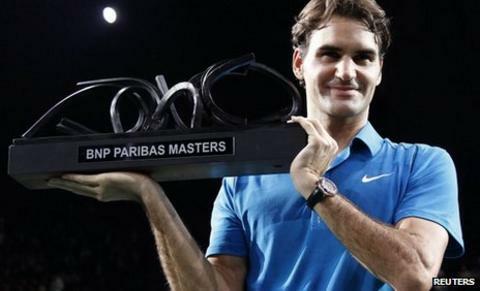 It was the Swiss maestro's 18th Masters title, and his 69th tournament success. "I'm amazed by how well I played," said Federer. "I'm really ecstatic to have played so well this week from the first ball to the end. "I had many attempts to win Paris-Bercy and for some reasons I had not been able to win it earlier, so it's a special victory." Federer is now unbeaten in 12 matches, having won last week in Basel, and becomes only the second player after Andre Agassi to win both the Paris titles - the Masters and the French Open at Roland Garros. It also ended the threat of Federer going a whole calendar year without winning a Grand Slam or a Masters title for the first time since 2001. Tsonga, who won the Paris Masters in 2008 and was given vociferous backing from the Bercy arena crowd, made a tremendous start in his customary all-action style, but after negotiating the double break point scare, Federer duly reeled off five games in succession. Although the crowd were predominantly behind Tsonga, there was a moment of brilliance from the stylish Swiss player that was met with widespread gasps of admiration. A keenly fought rally saw Tsonga send Federer scampering to the back of the court to retrieve a lob, but the 16-time Grand Slam winner simply waited for the ball to sit up, spun around and hit a devastating backhand pass without even needing to see where his opponent was. The French fans thought their man had earned a break and a 5-3 lead in the second set, but at the culmination of a thrilling rally a Tsonga pass that appeared to have been a winner was adjudged to have missed the baseline by the narrowest of margins. Both men now head to the end-of-season ATP World Tour Finals in London, with Federer arguably the man to beat when the tournament gets under way on Sunday. "This year is much more even (than the previous years), that's going to make the groups nicely balanced," he said. "I need slight adjustments for a lower bouncing court, I hope to be in good shape." The draw for the eight-man ATP World Tour Finals will take place on BBC Radio 5 live at 1230 GMT on Tuesday.